Installation Piece, made of wood, plexiglass, acrylic. Light pole installation, metal sculptures and information panels. Collection of Paintings, acrylic and watercolour on board. Painting, acrylic and watercolour on board. 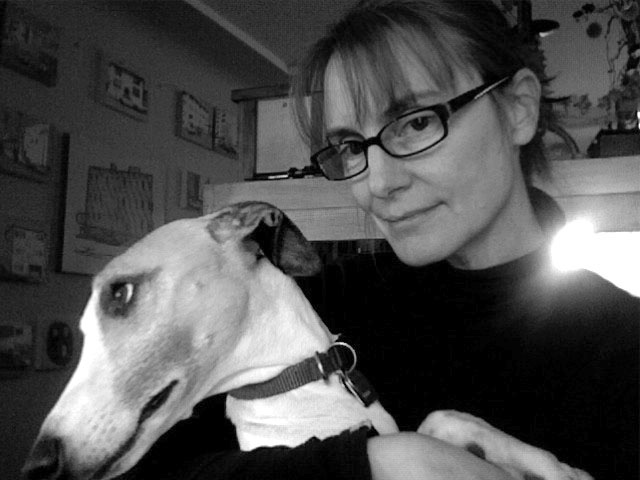 Monique Genton is a female artist of the Canadian Pacific Northwest, who works in a variety of art mediums: from painting, to film, to photography, and often combined. 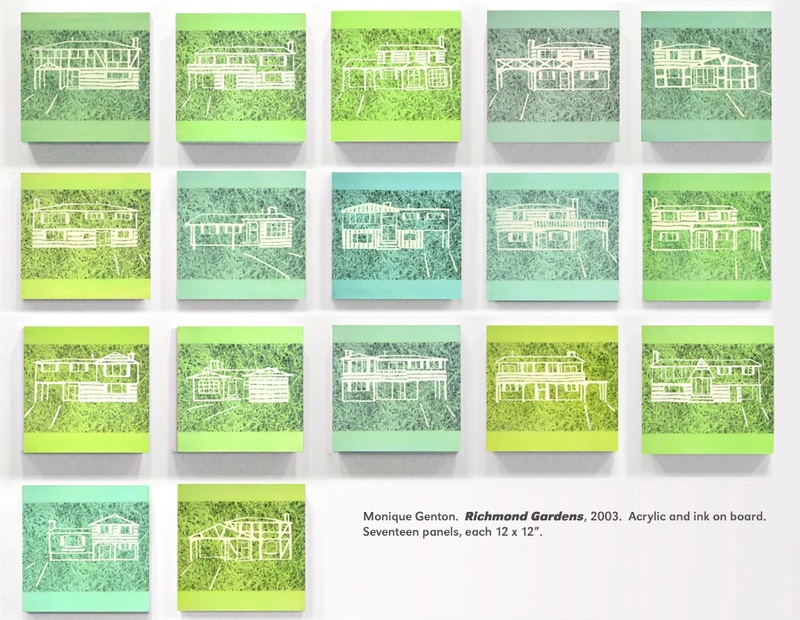 Monique’s art is socially charged, from earlier work that focused on ideas of the female body as object, and more recently, regarding ideas around land development and architecture. Monique’s childhood consisted of living in the eastern farms and forests of the Ottawa valley, along with the western suburbs of Richmond and the rugged coastline of B.C. These earliest experiences lead to questions of land development, which have now become a big part of her art. Staring out in a career as a medical radiographer, Monique went on to study art at a variety of schools. From New York (American Independent Colleges of Art), to Halifax (Nova Scotia College of Art and Design), Vancouver (Emily Carr Institute of Art and Design, University of British Columbia), and Chicago (Art Institute of Chicago, Art and Technology), Monique learned a great deal about social and technical aspects in art (CCCA). Monique now lives in Victoria, B.C., and is currently focused on capturing local apartment architecture and indigenous plant and Garry Oak meadow conservation. The following is an interview with Canadian Pacific Northwest artist Monique Genton, that occurred on October 19th, 2018. The major topics discussed were Monique’s art inspirations, education, and her current art work that features local (Victoria) apartment architecture. Childhood, Architecture, Ottawa, Richmond, Feminism, Public Space. Edited/Final Draft, October 19th, 2018. Ashley Riddett (A.R.) Hello and thank you so much for being a part of our oral history project. Today is Oct 19th, 2018, and I’m speaking with the lovely Monique Genton. Genton? is that how I pronounce? Monique Genton (M.G.) Yes that’s correct, Genton. A.R. Wonderful, my name is Ashley Riddett and I’m a student at the University of Victoria, and I’m doing an interview oral history project of the pacific northwest women artist. Our project is called “voices of contemporary women artists of Canada: Canada’s West Coast: An Oral History Collection 2018”. So I guess I will start with the first question: Even though you’ve been to and lived in many other places in the past, you have decided to live and work in the Pacific Northwest, and my question to you is, what are some of the professional or ah personal reasons you have chosen to belong here? M.G. I think the main reason I live here is really just the natural beauty of it. My family moved to Richmond from Ottawa in 1964, and that was a very exciting time. It felt like a blank slate here, compared to their life in Europe, and life in Ottawa, which was an older city – a lot of established people, businesses, and families. My father was setting out as a new engineer, and BC was like the wild west. So it was good for my parents, but it was great for us too because it was like a clean slate, anything goes. We moved into a brand new sub-division in Richmond [laughter], after having lived on a 100 acre farm in the Ottawa Valley…. M.G. ….and moved to this sub-division to a house on a small lot– it was one of these crazy sub-divisions made of cul-de-sacs, and cul-de-sacs coming off of cul-de-sacs. But it was exciting because everything was new. There were maybe six different house styles and they were repeated throughout the neighborhood. So we lived in a house that was called “the Oak”, and I had two friends who also lived in “Oaks” [laughter]. So, it felt like, this very, a kind of a leveling out of social class and financial class, you know? So it was great. The school was brand new, all the kids were brand new, we were all in the same place, so it was pretty exciting. And I had never seen the ocean before, and I had never seen mountains like this, and that first impression of Vancouver in 1964 is still the thing that makes me excited about living here. And I’ve had opportunities to go east, and I’ve lived in other places, but I’m always so glad to come back here, so here I am. A.R. And, so that was in around Vancouver…. M.G. Yeah. Vancouver Island. This is a small city, here, Victoria. My husband wasn’t keen about coming here because he’s more of a big city guy from Montreal, and liked his urban life and he, he resisted a little bit [laughter], but it was, but we were inspired by affordability, and being able to stay in a similar kind of area with the beautiful nature and we’re just so so happy to be here now and to be away from the mainland, and now I don’t want to take that ferry over [laughter] to the mainland. I want to stay here. And it’s been really exciting discovering. I mean it has some things that Vancouver gave us, but the coastline is varied, the trees are different, this is a really unique little ecosystem here, and I’ve been learning about this ecosystem and I’m a member of the Native Plant Study Group at UVic now, and I’m now a propagator of native plants and a collector of native plants and that’s all good. I never had my own garden before and now I’ve got my own veggie garden. It’s just all the things we couldn’t have before, now we have. And people here are more chilled out. The Art scene is different, but I’m finding my way around a little bit and it’s taken a long time. We’ve been here 8 years now and I still feel like I’m landing in many ways, getting used to things, getting our house fixed. Making friends. But it’s been a great opportunity too to redefine myself, or to just define myself not necessarily re-define, but there are things here that do echo my life in Ottawa. And I think about that landscape a lot still, every day of my life I think about the landscape in Ottawa, because I was so lucky. We, lived on a 100 acre farm. It wasn’t our farm, we just leased the land. My father was in University and my Mum had nine kids, so we were a great big family and we needed all that space, and I just got to wander around this landscape all the time, and I really thought about it a lot. There was a stand of forest, we called it le chateau. And I would spend all my time in that forest, walking through the fields, climbing the trees, and it was­–it was paradise. And I’ll never have anything quite like that or those experiences again, but I think about them. And sometimes in certain landscapes in this region, I feel the echo of that. Here in Victoria you do see open fields, like the Garry Oak meadows are naturally a more open landscape. In Vancouver I recall when we came and we first went to a forest, and it was like “oh my”, you can’t walk through the forest here because it’s all brambles and shrubs and it’s dark and the trees are really tall and they’re evergreen and so it’s always dark, even in the summer…. M.G. …. and I remember those feelings and I remember seeing the ocean for the first time and noticing “Oh, it has a funny smell”. And how come the rocks have these white teeth on them? I thought they were teeth, I thought that the rocks could bite you, because the little…. A.R. ….Yeah the little barnacles look like molars…. M.G. ….Yeah they do [laughter] they look like molars! Scary for a kid. Anyway, so I have a really deep sense of the land that seems to reside in my body and, in certain environments I feel resonance with the land, so, here I am. A.R. Yeah, well, I think it’s an excellent choice [ laughter]. If you’re good, I’m going to move on to question…. A.R. …. that I have here so, throughout your career you attended various art schools from all over Canada and the United States. How does your international education background figure into your work that has been done here. Or, in other words, in what way has there been a fusion of styles or techniques that you have learned that were from both international and local in your art? That’s a tricky one [laughter]. M.G. It’s a big one. But it’s a good question. I started out painting landscapes as a young woman in my teenage years and then began to paint again my mid 20s. But I was busy with career and life and I didn’t go to art school full time until I was in my mid 30s. I had in my mind an idea of what art school might be like, but it was really a kind of an old-fashioned idea, where I thought there’d be lots of people like me painting landscapes and [laughter], but no. So at the time it was almost an environment in development at that time where painting was not fashionable anymore, and so we were seeing more photography as art, and it seemed like all the cool students were doing video and film making and various kinds of installation art, and so that was something I had to wrap my mind around and, but you know we all want to be cool, right? M.G. ….We, were going to school to learn and to learn different things from what we’d been doing, and so as I, as I did my studies I took some classes and I started to, post-modernism was the thing and, reading all that stuff around that, and feminism, and this school was just starting at that time to offer classes about, gender, and gender identity and I felt that I really had to expand my thinking now, I realized, okay, there’s a part of me that wanted to hang on…. M.G. ….to what I knew best and what I had learned in my painting up until that time, but I saw these other things going on around me and I didn’t really go into those directions fully until probably my fourth year, and then graduate school. And I did my graduate studies in Chicago, and actually the school wasn’t as progressive as Emily Carr College, in Vancouver, but you could seek out. I thought, well I think I need to stay on this path and so I sought out teachers, and there I did film studies, I also did an exchange with NASCAD in Halifax and I also did film studies there. And I was very interested in experimental film. I knew I didn’t want to be a film-maker, it takes too many people, too long, to much money, [laughter] but I liked experimental film. And so I started, that’s probably where the–at least the black and white images and the idea of using multiple image–came into my work. In Chicago I was so keen on experimental film that I started going to extra sessions. One of my profs invited me to attend a film society in Chicago that was a by-invitation film society and it was mostly profs and critics and I got to go and be there and they would show a couple of new experimental films…. M.G. …. and I was super excited and I found I actually had things to say when I was there at these meetings, and it was great. So then in my graduate work I did an experiment, well like a video that was actually made completely out of still images which I animated in a kind of a Ken Burnsian way—though I’d never heard of Ken Burns at that time. I came across and old book called Swimming Simplified ,where I found the old photographs of women swimmers and, I think it was published in 1929. And, the book itself is quite interesting in that well, first, to think that you’d read a book to learn how to swim is rather odd…. M.G. …. but that was a time in history when there was a proliferation of manuals on everything. So I used old images from that book. And I had read Kate Chopin’s book The Awakening, a famous feminist book, and I was still distilling the ideas around that. I find it a fairly abstract book, and so it’s open to all sorts of interpretation, but basically it’s about her awakening as a woman, perhaps her sexual awakening. And so I took images from that, from the swimming book and I overlaid it with some narration from The Awakening and I added text from my own life struggles. Anyway, it was a layered, short video called the Science of Swimming. I went to art school to be a better painter and yet my graduate work ended up being a video, with all these layered meanings and texts and stuff and, yeah [laughter]. So, I got pretty far away from my original intentions, but… And then once I finished graduate school, I exhibited that kind of work for a while and then I realized it was kind of, you know, all the feminist readings were kind of making me unhappy…. M.G. …. And so some years later I started to turn back to the thing that had originally inspired me as an artist which is the landscape, but now bringing those techniques and the information from art school into my approach to landscape…… that was a long answer [laughter]. A.R. No, it was, it was an excellent answer! [laughter]. Most excellent answers are longer, so no it’s great. No, I really like that, I really like that you were able to use you know a lot of your different, educations that you have from different places and be able to integrate those, but also to go back to initially what you were there for in the first place what you wanted to do. So it’s kind of like you went full circle, and I really think that’s really admirable so that’s great. Okay, so question three: When I was looking at your background, doing a little bit of digging on you, I noticed that in some of your most recent works that I could find online, that you had an interest in the urbanization of space, specifically in the pacific northwest. I believe it was probably when you were in Vancouver or you know [laughter] on the other side of the water. A.R. Essentially, and I was really interested and really struck by that. And I was just wondering, what are some of your reasons for that interest or specific concerns regarding the development of the local urban landscape. What is it that intrigues you to go that route with your art? M.G. I think that, well, when we moved to Richmond in 1964, Richmond was a very, flat place with, a one-level shopping mall and, there were still a lot of farms. And then, as we started wandering a little further as kids and going into Vancouver, where you cross the Oak Street Bridge and there were these apartment buildings there, Marpole was the neighborhood. And I used to look at these apartment buildings and just wonder about them. I don’t think I had an opinion I just wondered about them. And also, I remember when we arrived by train from Ottawa and seeing the BC Hydro Building on Burrard street and just going “wow, I have never seen anything like that before.” And I recall one time after doing some sport, in school and the teacher was with us and another teacher was driving and he dropped her off at her apartment building in Marpole and I just thought “wow that’s amazing, she lives in one of these buildings.” And this is what you did when you left Richmond. You moved to one of these apartments and had your own place. So it was thinking about what life was like in those buildings. And then as I spent more time in the region, I lived in various places in the Fraser Valley and then moved back to Vancouver in 83 and I was, I think, I probably had been an environmentalist for quite a long time. I went to the first, I forget the name now, the Sea Shepherd people–, anyways I went to the first big rally. It’s the only time I ever skipped out of school, was to attend that first Greenpeace rally…. M.G. ….downtown. And, so I had this awareness of the landscape and watching it urbanize. And so as a young teenager having concerns about this, but also a fascination at the same time, so I’m really kind of growing up and just paying attention. My father is a land surveyor so I’m seeing a lot of his work and what he does, a lot of plans lying around the house and all his engineering stuff. Just having this awareness from an environmental perspective and from a development perspective, just having my eye on architecture. And then I did my graduate studies in Chicago and, wow, when you live there you can’t help but fall in love with architecture. A co-worker of mine, before I went there, told me “oh my sister lives in Chicago, you could stay with her until you find a place to live.” And I said “oh, well were does she live?” “Oh, she lives in the Hancock Tower, and I said “well what’s that?” “oh you’ll see”. [laughter]. So I get to Chicago and I’ve got this address and I get to this place and oh my god, its 95 stories tall…. M.G. …. The Hancock Tower, the famous Chicago Hancock Tower, black with those big X -shaped exterior, its just this massive metal structure. And I got to live on the 72nd floor, and it was just like, boy, if you weren’t paying attention to architecture before now [laughter], I was really paying attention to architecture because this is a life changing moment when you first go up there. It’s so tall and the winds in Chicago are really strong and so the walls are actually suspended on these tracks and there’s movement, a little movement in the building. You don’t really feel the movement but you hear the crackle of the walls adjusting to wind forces. M.G. ….For the first while I couldn’t go and stand near the window because it was so, so tall. So anyways, now coming back to the West Coast here and looking at architecture again and looking at things that echo a little bit with my Chicago experience. And I had done some studies in New York city too, so it was all starting to build up in my mind, and how fantastic architecture is, and learning about some architects and this is artistic expression too. So now living, looking, but still remembering always that excitement I felt seeing those three story apartment buildings that were on the other side of the river from Richmond. So it was as though, those buildings embodied a sense of, this is where you go when you grow up, and you can live on the third floor and have your own space, you can be free, and you know it was the 60s and 70s. It just was like everything goes, the hippie generation. So all these things were forming in my mind and so now, getting/having enough distance from my graduate experience and the different ways, all the different directions I got pulled in. And now coming back to it. I still use my computer as an essential design, planning, and thinking tool, but I’m back to painting, down in a more simple, pared-down way. And I’m collecting these apartment building photos [laughter] from around the city of Victoria now. I did that in Vancouver and now I’m continuing, and here there are so many interesting ones and they’re different in that the spaces around the buildings here are wider, and the trees are a little bit different. Because I think there’s more space around the architecture there is more landscaping, and you have more outdoor parking lots here, whereas in Vancouver the parking tends to be underground, even in the older buildings, with maybe a couple of little spots. But here it just seems like there are acres of property. So now I’m looking at architecture and looking at the relationship of cars to the architecture, and thinking about the use of land in that way. But on another level just looking at them… There is an experience that I keep having, as I’m out walking and I see a two or three story, maybe a 40s to 60s building and they’re often white and the light is hitting the side of that building so that the architecture dissolves into a form, just a form with light hitting it. And this is something that has interested artists for eons if you think about it but, for me, as an artist, having gone through all this education and all the politics of feminism and so on, now I’m back to just what it is that interested me [laughter] in art and landscape, looking at this form hit by light, watching the shadows but also thinking about the use of the land and the number of cars, and its interesting now how these big parking lots around the buildings seem to be sparsely used. So you have a great big building and you see one or two cars, so for me, that I just love, so I’ll come and photograph that building, and I may come back six times to capture the light hitting certain aspects of it, and then, I bring that back and I work from those photographs. And I think I’ve probably strayed off our question quite a ways by now [laughter]. But it is, I guess, the urbanization of space. So, I get to have a resonance with that excitement I felt in the 60s, coming to Vancouver and there’s a clean slate, everything looked modern compared to Ottawa with their dark brick buildings and steeped in history and old, old families living there. Here there’s that newness, for me anyways, for us…. M.G. …. immigrants and, people moving here. So there’s this newness and it resonates with the architecture. I think the architecture of the, the 50s 60s had an optimism about it that I really like too, and I feel it. It could be just the newness, like the break from the old. We’re not going to have arches and, brick and now it’s this white plaster building and it’s practically a perfect cube with just little things jutting out here and there for balconies. It must have been just so exciting for those architects. 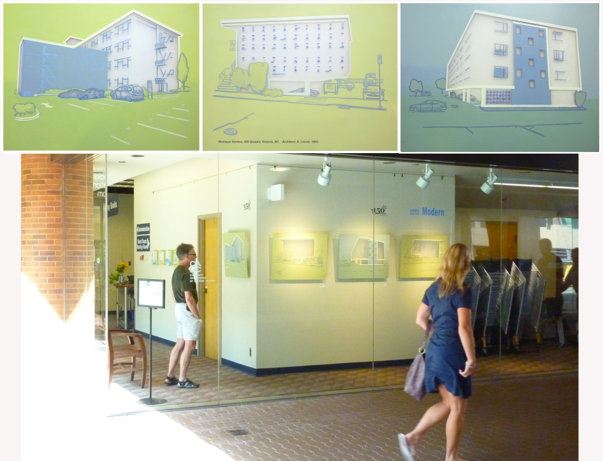 For the Victoria 150 celebrations, I got a grant to do four paintings of mid-century buildings and that was a lot of fun. So I did that and I wrote about what it is that excited me about it. And now we are seeing these buildings starting to disappear with development and that’s pretty sad. The medical building at Pandora and Cook is one of my favorite buildings in Victoria, and now I’m not sure if they’re keeping it–it’s just a shell, all the windows , and staircases –everything’s been removed. There’s a big tower going up next door. I’m glad that I photographed it when I did. I probably have 150 photographs of it from all different angles. I didn’t know at the time it was going to be demolished. Anyways, so I’ve painted that from different aspects. Sometimes in a larger painting. That’s the one there, Medical Arts. And I’ve done some smaller works too. A.R. ….And, so I think that those images might be really valuable later on, you know, like…. A.R. …. considering architecture of that time and, what it meant to you, kinda like the newness and the excitement around them and everything. So that’s captured in the photograph and that’s really special…. A.R. ….So, thank you, that’s great, so on to question four so… In the past I’ve seen that much of your work has featured women, or at least bodies of the female form. So, as someone who works with the female body and as someone also who identifies also as a female artist, how do you think ideas of women, gender and identity are considered within this local art community, is there something that’s special about the Victoria art scene when they consider ideas of women identity, or? M.G. I don’t know that I can really speak for the Victoria art scene…. M.G. ….because I still feel like a new person here but…. M.G. …. the Community Arts Council put on an exhibition earlier this year, to feature women’s art, and I participated in that and it was fun and I felt, I kinda felt a bit like it was back in the 80s or 70s maybe, and I do wonder, I have been wondering lately “where did feminism go?” because, young women don’t seem to think about it very much anymore I mean I guess they’re enjoying the product of our efforts…. M.G. ….but, they can do what they want now, you know you can have it all [laughter]. Family and career and work and be respected in the workplace and so it brought a lot back for me participating in that exhibition, but it’s not really a happy thing…. M.G. ….I think having gone to art school when I did with everything steeped so deeply in those issues of gender and feminism. In contrast, the kind of work that I’m doing now, with the abstract images of landscape, and the work my low-rise paintings,–that feels more like the true me: the pre-politicized artist. And I do see politics in everything still, and it’s there, it’s a layer of meaning in everything, just who made this, who designed it, why do we have what we have? Our landscape, it’s layered, everything is layered with meaning. But I’m not now specifically, I’m no longer working with images of women, although my swimmers series I do think is probably the best work I’ve ever done, but now part of being in Victoria is kind of freeing up for me. Oh, I don’t know people here, they don’t know me. I don’t have a gallery here. I’m just gonna going to see where my heart is and I feel here I’m able to go back to that child who wandered around the hundred acre farm and loved looking at everything, and I can have those eyes again here.” Every day my husband and I go out on what I call ‘an adventure’, well “let’s go to a different place and we’ll go look at something here and there”, and eight years later we’re still finding all these fantastic things to go and see in Victoria. And I always have my camera with me, and I usually see, on the way, some building and “oh, have to stop here, photograph this building” [laughter], it’s filed for me to work on later. So, so yeah, that’s where I’m at. A.R. It’s really nice that you said before in one of your other answers to the questions, the idea that in Victoria, now that you did this move and everything is relatively new for you, it’s like a fresh start. You’re really able to go back and kind of focus on things that maybe you didn’t necessarily have the chance to before, but now you can rediscover and look into those and put energy into that, and that’s very exciting…. M.G. ….And I think in Vancouver, I taught at Emily Carr for a few years and, I was friends with some of my old profs and I always felt in a way those eyes were on me. “Whoa I better do the right, I better do the hip thing,” [laugh] you know the politically right thing in the art world, if I want to be in that scene…. A.R. …. The scene of expectations…. M.G. ….you do need to embody some of those trends and directions, and artists like to think they’re not influenced and that they’re totally free to do what they want, but if you want to exhibit and you want to make certain connections, it does influence your work, for sure. A.R. It’s almost like there’s a game in a little ways, like there’s a set of rules…. M.G. People writing about your work or not writing about your work, yknow it’s… yeah. A.R. Yeah definitely… as my dad would say it’s how you play the game [laughter] So, I’m going to go ahead to question 5, so this one’s a little bit more meta, a little bit more kind of big ideas broader strokes, so I’ve written: We live in an unprecedented time of like hyper-connectedness in 2018, near instant accessibility to ideas and art from all over the world, and I was wondering, what are some of the things you feel makes the pacific northwest art unique, and what do you think you would like to have shared about this area and celebrated on a global scale, what do you think makes this area of the world when considering art special? M.G. I actually never read Emily Carr’s books until I moved here, and what an eye-opener. They were written what, 100 years ago, but they read like they could have be written today. Her wide-eyed look at the landscape and I thought, wow, this is this is terrific stuff, going out camping, being in the woods and then engaging herself in Native art, being influenced by that. So when I read her book it just seemed like this is it, everyone should be reading this now and looking at it with our new eyes, but this person has spoken it all. And she was a woman and she struggled, she went to art school in the US and in Europe and she had trouble having people take her seriously and all that is still very prevalent today for women artists. But I think in terms of our hyper-connectedness, I’m paying more attention now to Native culture, and I feel as an artist, as a non-native artist I feel a sense of wanting to step aside and let their voices be heard more, and certainly to make room for it. And I think environment, environmental issues are really something. If we don’t save our forests then we’ll have nothing. I don’t have money to protect, you know, marmots [laughter]. Now I’m looking to adopt a marmot, and that to me just all seems more important than art and the way I’ve been thinking about it. I think environment, if we don’t make it front-and-centre we’re not going to have it, and all those things that excited me as a child and all the things I learned from being in the forest, and the land, we’re not going to have it. I’m really concerned about whales right now. I’m writing letters and I find it so upsetting when I see all the whale watchers come and encircle the whales when they’re offshore, I saw a lot of that this summer and I’ve been writing letters ever since. Because the whale watchers say that they’re actually environmentalists and they’re trying to raise awareness about whales. And I’m saying, well then, why not leave them alone? You’re not doing anything for them, you’re making money bringing people there, and maybe you get to talk about whales more, but the whales would probably prefer you not be there, [laugh] so let’s leave them alone. So I think those things are foremost in my mind right now, and I think about. I guess my job right now is how can I be an artist and an environmentalist. Years ago, I was seeing this and some environmental art were, the product of women artists’ work. There was an exhibition, I saw in Nova Scotia called “re-photographing the land”, and it was great big photographs of clear cuts and things like that. There are other artists doing things like that now but at the time it was really putting this stuff in our face, and it felt really raw, and like, holy smokes, this is actually seeing the images of it, and that being art sort of brought those things together for me. So I think if you have a consciousness around that and you’re an artist, those are the questions I have for me, now, I think my Grass Project that I did was sort of around that. It was at a time when I was finishing my swimmer work and then, finding myself drawn to landscape again but having had all that art education where my landscape art thoughts had been pretty much drummed out of me [laughter]. Now trying to find a way back, and that’s what led me to all the photography, going back to Richmond, taking photographs. Taking photographs of parking lots that have the little token tiny piece of grass and thinking about that. Did a whole series on that, [laughter] did an exhibition at the Richmond Art Gallery called “The Grass Project”. I really enjoyed doing it and I’m still thinking about it. That is really artwork about environment, so I guess I’m getting there [laughter]. It’s still on my mind, it’s not the flavour of the day because that’s where I’ve been since I was a child starring at the landscape thinking about it. Yeah. A.R. Wonderful, so I added a couple of extra questions…. A.R. ….Of course [laughter] but they’re very straightforward, one of my questions is: Is there anything you would like to add to this interview in respect to our topic of discussion regarding kind of women artists and the pacific northwest, is there anything that we haven’t covered that you would really like to speak to? M.G. I still think that male artists are taken more seriously. So, I don’t know what to do about that. I think perhaps that, now that I’ve been out of art school for a while, I often talk to my friends who went to art school and we think how formed we were by art theory. Now I think we’re all trying to find a more of an organic way of being an artist and being in the world. I think it’s a difficult thing to, well I think there’s a history of characterizing women’s work in a certain way and there were certain styles and perhaps, ways of looking at women doing artwork and going “oh isn’t that sweet, she does, like … whatever,” right. I think that’s still difficult for women to find their way in the art world without applying a more aggressive or political, traditionally men’s game. Not that politics is essentially a men’s game, but historically it’s a men’s game. There are women who definitely could pull it off–I just wish there was a little bit more. I find that there is a local scene that seems like more of a traditional women’s practice, and then there are the academics, or those coming through academia who are doing, addressing the big issues, getting the big shows and getting the big recognition, and some of us are stuck in between the two, because we see the value of looking at smaller views of the world perhaps. I hate to characterize because I don’t believe in essentialism, that woman naturally do this, that’s a really dangerous place to go and I really hate that. But, perhaps we’re not as aggressive in the art world to get our work out there or we’re not willing to compromise, or there’s something that continues to keep women’s art production on the sidelines. Going to that recent Victoria women’s’ art show and seeing all these women who were just really [laughter] excited. And there was a bit of a 70s feminist feel there, and it was quite exciting actually, it was. And we’re all looking at each other and noting, “hey yah, we’re all here for the same reason.” It was fun, I hadn’t felt that for quite some time. But there is probably an evening out in the art of the commercial gallery scene. Victoria is very, ….to me there aren’t really that many galleries so I think that makes it even harder for women I think the more galleries there are, the more likely you’re going to be in one of them. The same struggles, I feel like they’re still there. I think a woman doing art is still more likely to be viewed as a pastime for her, and not a career and not having these ingenious ideas you know? it’s still seen to be in the male domain, in my experience. A.R. Ok. We’re not quite there yet. I just have this question. Where would you like to see development, for future generations, like you’re ideal, if everything is played out right, what would you like to see happen? M.G. ….Make it part of somebody’s budget, property management budget or whatever. A.R. There’s so many public spaces, like, University of Victoria does a pretty good job, we have art everywhere which is great…. A.R. But I feel like, when I go to like hospitals or other public spaces, there could be a lot more…. A.R. …. art than there is right now, and I feel like, for me there’s a disassociation between art galleries and the professional displays, and bridging that gap, like the transition from saying, this is done professionally, this is done in a very sort of, pre-constructed way and its very much to support these things, but to transition to a regular, normal environment with just regular day people walking through and stuff. It’s like there’s definitely a lack of recognition, a lack of art use that could be really utilized. M.G. I have a number of my works in Vancouver General Hospital and one of them, they really took a chance, to their credit, they have one of my grass works, it’s a large, multi panel piece in one of their buildings, and I just love the idea of that, and they do make it known which artists they have. They have a foundation that pays for the art and it really enriches the space. And they’re not just someone’s little landscape painting on the wall, they’ve got some artists who are on the edge of things. They have an installation of mine and some of my early landscapes that were kind of Emily Carr-ish influenced, of abstract landscapes of Vancouver forest areas, and I’m so glad that they have them. I mean if you sell a piece of work for a private collector, it goes into their home and that’s great, they’ve paid for it and it’s a kind of recognition, but I love the idea of my work being in a hospital. And how many hundreds of people are going to walk by there every day and see it. I think that’s brilliant. And I think most artists, I mean those works were purchased by, what do they call that (a foundation), anyways they were purchased. Donors donate money for their art collection at that institution. There are businesses that will take your work and they put it in business spaces. Personally, I’ve not had a very good experience with that, I’ve had my work shown and I’ve not been paid. I’ve had my work shown and it was damaged. But it can be done properly, and that is really exciting. Actually about a year ago I got a call from someone in Parliament, in Ottawa, and they were really interested in this piece here, this long piece and would I be interested in letting them have it for their . . . it was the Ministry of Public Safety… anyways there was a lot of back and forth and at the end of the day, they didn’t take it because they didn’t have the right space for it, and I was just heartbroken because for me to have my work there in Ottawa would have been just fantastic…. M.G. ….in the capital, where I’m from originally. And it’s kind of a challenging piece, and the fact that they recognized the value in that felt very satisfactory. It’s definitely a feminist piece too and, well, we didn’t manage to complete that transaction but I loved the idea of that it would be in Ottawa. In Europe you see a lot of art in public spaces and that’s what makes Europe so wonderful, and here we don’t [laughter]. A.R. Well there’s always hope for the future. M.G. Yeah. I think so, I think people, if they’d just put a little of their budget into having someone look after the art and keeping the art secure in wherever that little public space is going to be, make it part of the budget. Do it, give artists the opportunity, I think out at the airport here in Victoria there’s a space for art…. M.G. ….It’s not the best space, but it’s something, and I don’t know if the artist’s get paid for that, they should really. Because they’re providing art. A business buys a chesterfield for their waiting room, but they don’t seem to be too interested in paying artists for these things. Some maybe do, but I think that one at the airport is. I think you are allowed to sell your work from there and I think some artists do. A.R. ….But its sort of, more of a…. A.R. Yeah absolutely, I’ve seen them by that restaurant in there, they have the big ones by the washrooms before you go through security…. A.R. ….That’s where I remember seeing them…. A.R. ….It’d benefit not just the artists but everybody…. M.G. ….Yeah, public buildings. All government public buildings should have something. A.R. Yes, I think it should be plastered with it [laughter] it should be like…. M.G. Schools, Universities, there are lots of places where people have to sit around and wait. That would be great if they had something to look at other than their iPhones [laughter]…. A.R. ….Yeah, get our eyes up. Get us engaged in the environment again, that would be great…. A.R. ….pick your brain a little bit about where we are and where you are and…. 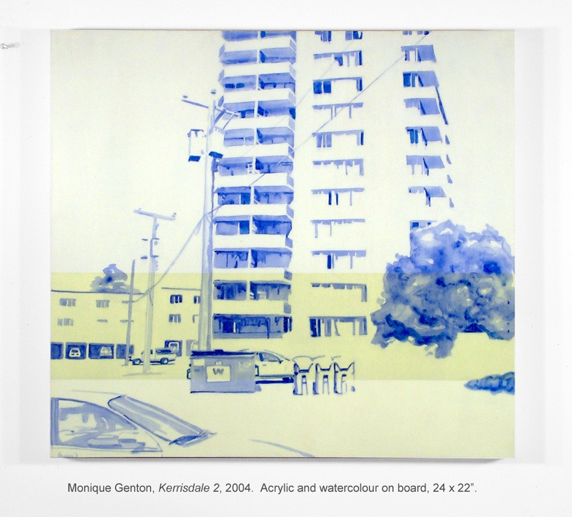 This is The Centre for Contemporary Canadian Art’s website, that features Monique Genton’s artist information. It includes a short biography of the artist, curriculum vitae, and a collection of her work ranging from 1996 to 2004. 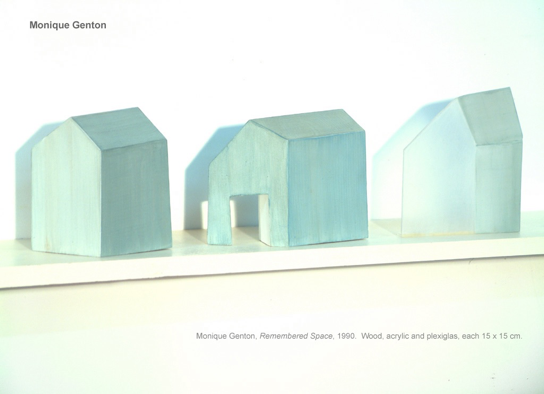 The Collections Canada website features some of Monique Genton’s pieces, ranging from 1995-2000, in a section called Women Artists in Canada. 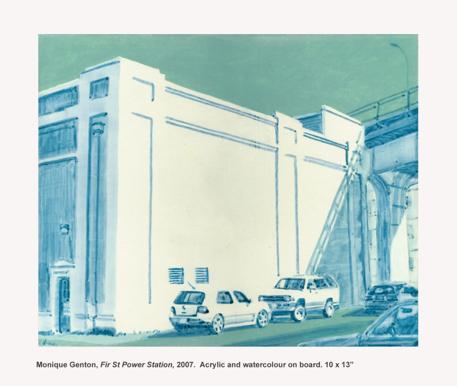 The site includes written captions, regarding Genton’s selected works, that provide important insight from the artist’s perspective on what the pieces represent. 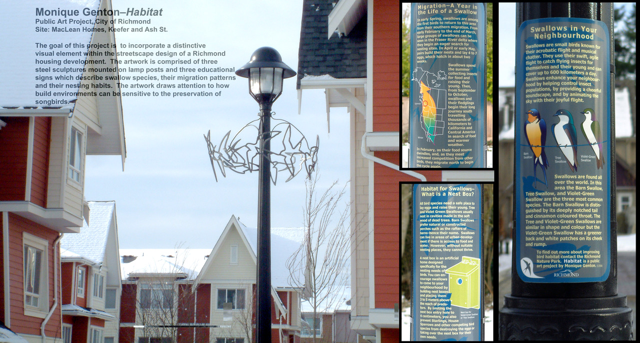 The City of Richmond website features Monique Genton and her 2007 art piece Habitat. The piece is a registered public artwork in the city of Richmond, B.C. Included on the site is information on the art piece and a short biography of Genton. This website is a Vancouver-based news site, that featured an art review of Genton’s art show: Tidy, at the Art + Soul Gallery in 2005. The page talks in length about the art show Tidy and features a biography of Genton as well. A PDF of a pamphlet created for an event: On the Edge of Chaos. This event featured Genton as a speaker on The Limits of Imaging: Portrait of an artist/technologist. The pamphlet features a short bio of Genton and about what she is interested in with her work at that time.